I immediately inquired what exactly he’d been smoking in New Orleans. I know for a fact that I haven’t been aging in reverse. In fact, it’s just in the past few years that I’ve gone from looking younger than my age, to … not. But when someone else, who has seen me continuously over the past few years, said she’d also noticed I looked different, I wanted to know what it was they were seeing–and more importantly, why. After dinner, when I stopped by the ladies’ room, I took the opportunity to consult the mirror. Indeed I did look younger. My face looked fuller, softer–relaxed. I realized the tension was gone from my face. What had I done, anyway? My laptop had died the day before, and when I got home with my new laptop, I was looking for ways to enjoy its exponentially better Beats Audio sound. I decided to listen to both the evening and–for the first time, the next morning–the morning guided meditations on Doreen Virtue’s Chakra Clearing CD. I feel compelled to note that the meditations include a couple of moments that could be construed as cheesy, but I am all about what works. Considering how well these meditations work, I am completely willing to forgive those moments (and I’m certain cheesy is in the eye–or ear–of the beholder). I listened to the meditations again last night and this morning, and today I found that doing the meditation really zapped the indefinable ‘crummy’ feeling I woke up with–I’m not sure of its source, perhaps the unpleasant storm that swept through with extremely high winds while I was still trying to sleep. The meditations had the same effect on my face as before. I hope you’ll try these meditations for yourself. When you do, I think you’ll find yourself feeling better, more relaxed, and yes–looking younger. 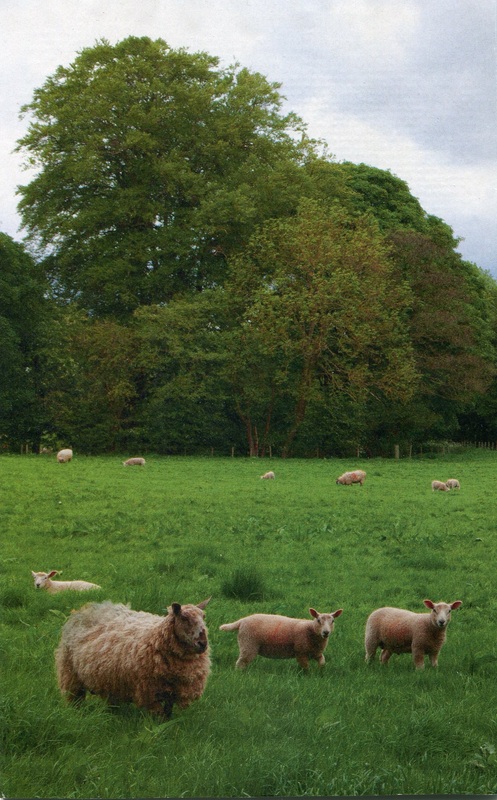 This post is illustrated with my SoulCollage card Jacob’s sheep, some of whom are very young indeed.